You probably know the deal with perfect pitch and musicians who can tune a new string just by checking its tension. However, there’s a big difference between playing live or in a small studio versus playing alone. More often than not, you’ll need to rely on a tuner and there’s no shame in that. I want to tell you that picking the right tuner pedal for the occasion is not as difficult as you may think. Sure, there are plenty of brands and types to choose from, but this handy list that I’ve put up should narrow down your search considerably. My top tuner pedal picks aren’t random. I’ve had chances to use most of them. Of course, no product is perfect but any one of the following should help you become a more professional musician. The following pedals are my top choices for tuning your guitar on and off the stage. Are Polyphonic Tuners Always Time Savers? How Important is Accuracy Really? 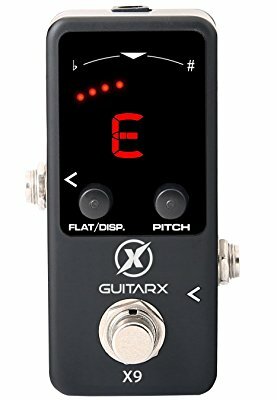 Why are Tuner Pedals Useful? How Many Types of Tuner Pedals are There? How Important is the Display? Personally, I have a soft spot for TC Electronic devices. 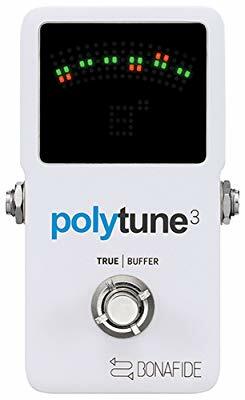 Although I never looked at the PolyTune 2 as one of the best tuners, there’s just something about reading all strings at the same time. 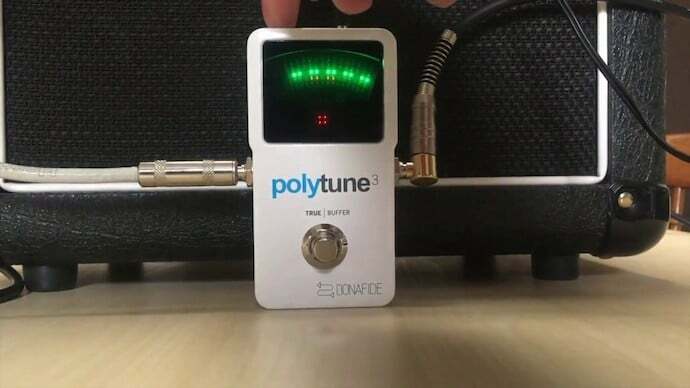 Then the PolyTune 3 came out with some much needed adjustments. For one, you can now keep the tuner on while you play, which wasn’t possible with its predecessor. The customization still has a long way to go. You can use the pedal for standard and drop D tuning, but it still won’t work on custom setups or open string setups. The detection has improved somewhat, but there’s still a long way to go. Be that as it may, there are very few manufacturers that seem to have an interest in refining polytuning technology, so hats off to TC Electronic here. 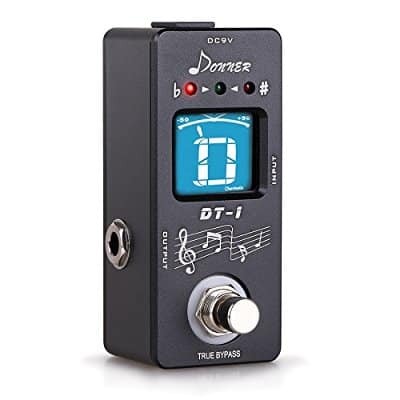 At first glance the Donner DT-1 is just another cheap tuner pedal. However, it wouldn’t be on this list if it wasn’t among the best ones for live and solo situations. This chromatic tuner has insane visibility. It seems faded at first but that’s because it’s different from what most tuners give you. Even if you can’t clearly see the letter from afar, you can still tune your string and know when you’ve hit the sweet spot. The entire screen turns green when you’re at the right frequency. It also has true bypass which is more than I can say for most pedals in this price range. The response time is not as fast as higher-end tuners, I’ll give you that. But the DT-1 is very useful if you like to wander around the stage a lot. 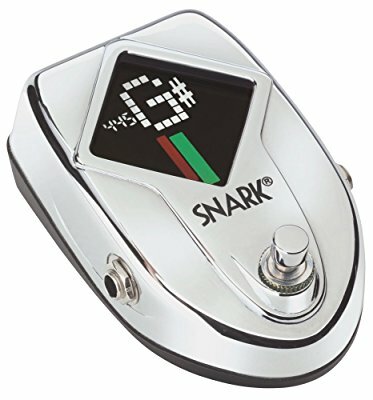 The SN-10S is an interesting mid-range tuner. While it doesn’t have the best display out there, it certainly scores high in terms of pitch accuracy. The scrolling is quite smooth even though it can be tough to spot the lines. The responsiveness is also impressive given the low cost of the SN-10S. It’s certainly miles away in performance from its clip on counterpart. Although there aren’t many customizable features to this tuner pedal, it would be a shame not to give it a try. Its accuracy exceeds far more expensive models when used on bass guitars and baritone guitars. The overtones don’t seem to confuse the sensors at all in this case. 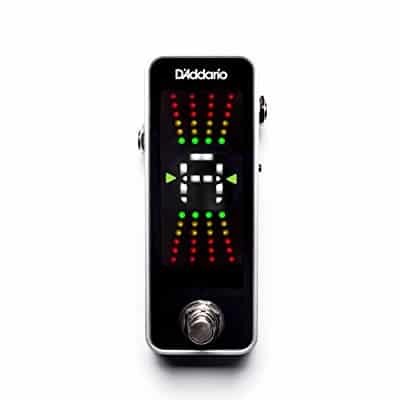 The D’Addario Chromatic Pedal Tuner is another highly responsive mid-range tuner. I say mid-range because of the price, but in terms of performance it’s much better than you think. The advanced processor facilitates quick frequency response. It also comes with true bypass, so you avoid any extra noise on stage. The display is vertical and brightly colored. Although it is quite robust, as it should be for the money, it’s also lightweight and slim. This means you’ll have no problem adding it to a stacked rig or a very small rig. Compared to the wildly popular Boss tuner pedal, this one is definitely superior. It’s also a bit more efficient, but the design alone is enough to give this tuner an edge over more expensive models. Whenever I see a tuner that comes with a metronome I can’t help but wonder why don’t all models have this feature? The X9 from xGuitarx is among the finest tuners on the market. It has a massive screen with very good readability in almost any lighting. You can even look at it from an angle and you’ll still be able to tell if you’re on red or green. The letters might not be that easy to distinguish though. The included metronome makes this a very useful tool for solo playing and for rehearsals. You shouldn’t get it for its stage use on account of the metronome alone, though. There are better devices you can use for that purpose. You can adjust the X9 for guitars or for bass guitars by using the flat button on the left. The one big downside? There’s no true bypass. You will be muted while you tune. What else can I say about Korg and the company’s constant success in the music industry? Not much, but I can tell you a bit about their Pitchblack tuner pedal. It is equipped with one of the brightest and most intelligible screens you’ll ever come across. For live performances, you can hardly do better at this price range. Even the arrows that indicate sharp or flat are very easy to spot. The Pitchblack also gives you a very fast response. Not only that but it also holds the pitch far better than most tuners of similar design. The fact that it doesn’t respond to outside noise or vibrations helps maintain the pitch for longer which lets you tune your string more accurately. It’s nice to have the ability to see where you stand with all your strings with just one strum. In a way this helps you detect where the problem is when something sounds off. However much I enjoy the concept, this type of tuner is not for everyone. If you don’t play standard or drop D, it can be difficult to make use of a polyphonic tuner. For the time being, the technology is not too flexible. There also seems to be a significant lack of accuracy and response compared to regular pedal or clip on tuners. If you value accuracy over speed, this might not be the best option for you. Tuner pedals have a massive advantage over clip on tuners. Not only do they come with bigger screens in general but they can also mute your guitar tone once you start them. If you want to mask the fact that you’re tuning your strings mid-gig, this is one of the fastest ways to do so. True bypass tuners also manage to limit any extra noise that might output once the tuner is activated. Most tuners pick up frequencies within 1 cent of the note. One semitone is equivalent to 100 cents in either direction. The way you look at tuners shouldn’t always be based on this cent rating. Keep in mind that even the best tuner pedals won’t be more accurate than 0.01 cent. However, the difference between 1 and 0.01 is hardly noticeable by you or your audience. You don’t have to pay a premium on everything. A tuner pedal is a pedal that you can daisy-chain to the rest of your pedals, except you can use this pedal to tune your guitar or bass in the middle of a performance. These tuners can also have another output that plugs into a guitar amplifier. There is a display and a pitch detection unit on top of the pedal which helps the player determine the key. As an aspiring musician, you need to remember that while you are playing a bunch of unexpected situations can happen. There is a strong possibility for you to get so into the groove that you break a string or for your guitar to go out of tune. When this happens, you need to react quickly before the crowd notices something is happening. At that point, you would be happy to have a pedal tuner in your setup because it will allow you to quickly get back in tune and continue jamming. This is why most musicians who are regularly on tour have a pedal tuner as part of their arsenal. There are a lot of different pedal tuners to choose from. Chromatic tuners allow you to tune any instrument, not just bass or guitar. Polyphonic pedal tuners, on the other hand, give you the option to strum your guitar and see which of the strings need tuning. Some pedal tuners also come with different types of sensors to help with your tuning or adjust the level of brightness on the display. The type of tuner you choose largely depends on your needs and the music you play. Having a bright display can be very important because the stage can get pretty dark. If you need to tune your guitar on a poorly lit stage, a clearly visible display will make it much easier for you. There are more than a few pedal tuners that feature a sizable and clearly visible display, and you should definitely pick up a pedal that has one. As previously mentioned, some pedal tuners can automatically adjust the display brightness. Pedal tuners usually go from $20 to a couple hundred. More money usually translates to more features and a better and more reliable tuner. But there is no need to splurge right off the bat. 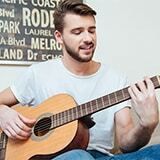 You need to think carefully why do you need the tuner and how often you are going to use it. If you are a touring musician who performs almost every night then you should aim for the best of the best. A premium tuner can help you stay at the top of your game. Pedal tuners are not as accurate as other types of tuners to begin with, so a good one might make a big difference. On the other hand, if you are just a hobbyist who likes to jam with his friends every now and then, an affordable pedal tuner would work just fine. I personally use both clip on tuners and tuner pedals. It really depends on the situation. Carrying a clip on tuner and having it on hand for an impromptu jam session is easy enough to do. However, I tend to favor tuner pedals when it comes to important rehearsals, recording sessions, and live gigs. You just can’t beat the accuracy and the response time. They’re not as cheap as clip ons but they’re just as convenient and easy to use. Besides, you look more professional if the audience can’t spot your headstock tuner, don’t you think?